It will not be wrong to say that at every Indian wedding it is all about pomp and show. Couples and their family members spent lakhs of rupees to plan wedding events so grand, which no one has ever seen before. A small yet very integral part of such grandeur is the arrival of the groom at the wedding venue to marry his bride. Arrangements like fireworks, Band Walas, Dhol Walas and even in some cases, mobile disco setup is done. All this pomp and show is to announce the entrance of the groom at the wedding venue. And if you too are looking for such kind of grand arrangements for your own Baarat and functions, then you are at the right place. Below you will find a brief list of different types of services and music options provided by best wedding band services in Ahmedabad. Wedding Band: One cannot imagine a wedding procession aka Baaraat without the noise of Dhol Baaja. You should hire a team of expert professional musicians/ Band Walas who can bring life and rapture to any ceremony. However, with too many Band vendors available in the market, couples get confused about where to spend and where to save. As a result, they end up hiring a fatuous vendor which ultimately kills all the fun from their wedding procession. Therefore you should always go for experts who leave a long-lasting impact on the Baaraatis with their rocking sound, skills, and state of the art equipment. Palki: Almost all the top wedding band vendors in the country are providing Palki services for adding a touch of royalty to the wedding. In earlier times, the Palki was used as a means of transport during a bride’s bidai. But nowadays, event planners are associating with Band Walas and weaving magical bridal entries using Palki. These carriages are often beautified using gorgeous flowers and silky drapes which gives it a regal charm. If you are getting married soon then we recommend planning your entrance at the wedding venue with Palki, spotlight, and soothing music. Baaraat Lighting Services: Another important aspect of a wedding procession are the eye-catching lights which surround the entire Baaraat. For the wedding procession, you can choose from various lights options like Jhoomar, Flower, LED, and Umbrella. These lights will weave a magical environment for the Baaraatis to dance and enjoy till heart's content. Depending upon the amount of money you want to spend on Band Baja in Ahmedabad, you can either have one form of light or go for multiple choices as well. Wedding Chariot: Like the brides, groom’s too are seeking special ways to mark their presence at the wedding. And the best way to catch everyone’s attention is through a decorated chariot (Baggi). A lot of grooms prefer Baggi decorated with flowers as it enchants everyone with its fragrance and beauty. Also, the chariot can be decorated to match the wedding theme and decoration. If not for the wedding procession, the Baggi can be used as venue entrance vehicle for the bride just like the Palki. It will add a touch of royalty to the wedding and will make the guests wanting for more. Bagpiper Band: If you are looking to add some unique form of entertainment to the wedding then a Bagpiper Band can surely become a good pick. The melodious sound of this musical equipment will pump up energy in the wedding venue and provide your guests with a memory worth cherishing. Originally such bands were a part of army events and were not a common sighting for people in general. Also, the band members are professionally trained and dressed in a manner to catch everyone’s attention. Wedding Mare: Also known as Ghodi in the local language, it is one of the most important rituals of the Indian wedding ceremony. A groom is required to come to the wedding venue sitting on a mare. Although separate Ghodi Walas are available in the market, nowadays a lot of wedding band vendors have started providing these services as well as a complete wedding package. Before booking, ensure that the mare is pure white in color (as it is considered auspicious) and the vendor agrees to decorate her with gold Saaz, having pearl embroidery. Fireworks: The best way to announce the groom’s arrival is through a mind-blowing display of fireworks. And not only for the arrival, but pyro-techniques are also used during the bride’s entrance and the Varmala ceremony. 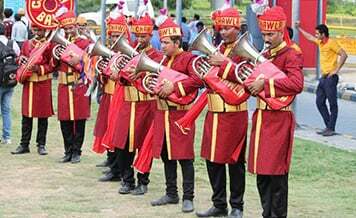 Best band wedding services in Ahmedabad provide professional experts who ensure a safe and enjoyable firework display for you and all the wedding guests. These are seven common services which are often provided by wedding band vendors in addition to the main Band Baja services. Although you can hire different vendors for all the above-mentioned services, it is recommended to opt for a single service provider as it will save your time and money. 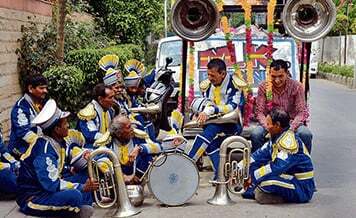 Brass Bands: This is the most common type of music band used in wedding processions. 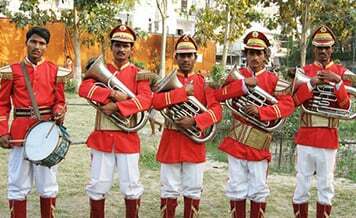 It often comprises of huge mouth operated musical instruments through which different Indian movies songs (old and new) are played. Dhol Wala: Another most loved, Desi music style for the Baaraatis is the sound of Dhol. Groom’s friend and family members often go crazy on the beats of Dhol and dance like there is no tomorrow, which is surely a sight to behold. Add a dose of energy to your wedding by booking a Dhol Wala. Live Band: If you want to add some light, not too loud music and entertainment at the wedding then a band of live artists will perfectly match your requirements. A group of singers performs different songs on the request of the wedding guests. 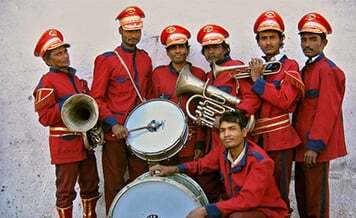 As per top professionals of Band Baja in Ahmedabad, live artists are very much in vogue these days. We hope after going through the above-mentioned information, you are now all set to find and book a wedding band vendor for music as well as other services. But where to start the search from? Well, the answer is Shaadidukaan.com which is India’s leading online wedding market. On the portal, you will find 30000+ vendors who provide excellent wedding-related services like wedding venue owners, food caterers, Mehndi artist, bridal and groom apparel shops etc. Visit and make your bookings today!